Woodwork is not one of the easy jobs but having good machines can transform your work to be manageable and less stressful. Bad machines can cost you a lot of time as sometimes they can fail and fore you to try to fix them or even get a replacement. This would mean spending money again for something you had not planned for. 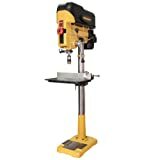 Powermatic PM2800B 1792800B Drill functions well so having it for your woodwork or even metals will assure you of great outcome. It is an easy, simple drill so it can be used by anyone. The Powermatic PM2800B 1792800B Drill has good qualities when it comes to speed. It is a speed drill. You can adjust its speed depending on what you are working with. This drill has a hand wheel with you use to either increase or reduce the speed, if you want it slow or fast. Adjusting the speed can be done without changing the belts. This will enable you to work on many pieces of wood at a time. Hence it can really save on time as it is very quick and smooth when you want to change actions. The Powermatic PM2800B drill comes with a manual for the user to use it as a guide to know to handle the drill. It is important to read it for your safety. So anyone can follow the instruction and know how to work with it. Its bigger base makes it very stable on any surface and also it is medium sized so it can fit in any workshop. This makes it also possible to use the drill when you are dealing with large pieces of wood. You will also find it easy to hold many pieces of wood together when using the Powermatic pm2800B Drill. Its dual LED lights make it easy to see well when using the drill so you do not have to strain your eyes. It can be adjusted to suit work requirements. This is because it can make a full swing of 18 inches, and has a spindle to base of 47 inches. It has a range of 400-3000 spindle which makes it easy to adjust the speed making it very much user friendly. Where you need to place the wood or metal, the table can also be adjusted from a width of 14 inches to 30 inches. This drill press is quite the heavy one. Weighing in at around 120 kg, it is a very sturdy machine and surprisingly stable once assembled. The parts, when assembled and set properly, make tight fits and overall, this drill looks like a machine that will last for many years even with frequent use. It comes with a manufacturer’s warranty of 5 years. • The drill’s dimensions are: height of 68 inches, width of 23.5 inches and a diameter of 31.5 inches. • It has LED control which also provides lighting. • It is 209 pounds heavy. • It has a dual laser guide system to ensure accuracy. • The drill has a large table for use to place material with a width of 14 inches and a diameter of 16 inches and this can be increased to if need be to a width of 30 inches. • It has a chuck which does not need a key when changes are needed. So it is user friendly. • It comes with a heavy duty for power. The Powermatic PM2800B drill has many parts which makes it to be very heavy. It can be very noisy, sometimes with a vibrating sound but you can reduce it by having it cleaned. When used for many hours, it can get very hot due to friction which is from the pulleys and the belts; to reduce it you can use it at lower speed. The manual does not cover everything about the drill especially on assembling of the drills parts. The Powermatic PM2800B drill is specifically made to suit any workshop. It is user friendly and it will make work simple and easy for you. It is has excellent performance and therefore it reduces disappointments at your work place. Its ability to adjust makes it perfect in its work. It has built in features that any other drill will not offer you. The Powermatic PM2800B drill was designed with the user in mind. Its packaging is super good so after your order it everything arrives as it should be.